Canadian crude oil shot up by 35 percent on Monday, narrowing the huge gap with West Texas Intermediate thanks to a controversial decision by the Alberta government to impose production cuts of 325,000 bpd until excess supply in storage clears. 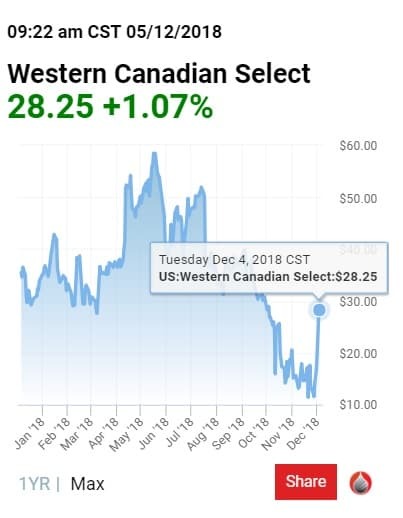 The Financial Post reports Western Canadian Select ended trade at US$29.95 a barrel, after on Friday it closed at US$21.93 a barrel. According to Bloomberg, the discount of WCS to WTI is now US$6 smaller, at US$23 a barrel. For a while on Monday the gap was even narrower, at US$19.75 a barrel. Alberta’s Premier Rachel Notley announced on Sunday that the government of the province will enact an 8.7-percent crude oil production cut, in place until the glut in storage clears. Afterwards, the cut will be reduced to 95,000 bpd, to remain in place until the end of next year. Yet not everyone in the local oil industry is thrilled with the production cut. Suncor was against it when the idea was first floated, proposed by the chief executive of peer Cenovus. The cut seems to be working, however, and that should be welcome news right now: yesterday Reuters reported weather-related power disruptions had occurred on two major Canada-U.S. pipelines, Keystone and the Mainland system. The two can ship a combined 1.79 million barrels of oil and other liquids daily.